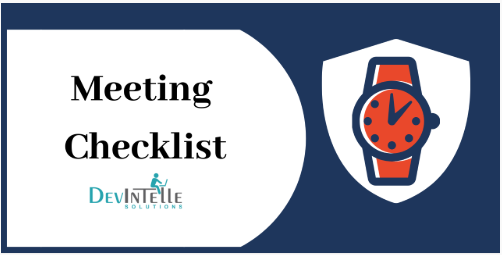 Meeting Checklist ⋆ DevIntelle Consulting Service Pvt Ltd.
Having effective meetings is not rocket science. This meeting checklist with a few simple meeting rules will help you have effective and efficient meetings. Meeting Preparation Checklist is useful for Organize and run more productive Company Meetings. There are Multiple Advantage because of Meeting Checklist . It’s also likely to keep you from feeling worn out and exhausted from meeting burnout. So, to help all the size of Organization Company we have Launched our New Odd Application for Meeting Checklist. This Odoo app will help you add Customer / Client Meeting Checklist which will be useful to a list of items required, things to be done, or points to be considered, used as a reminder into Meeting. Easy to remember important things. Meeting Checklist that are completed, based on that Checklist percentage calculated calendar form view.